The South India pilgrimage package, gives you a chance to go on a pilgrimage to the ancient temples that were built thousands of years ago. This pilgrimage tour will rejuvenate your body and soul for refreshing holiday trip to the sacred sites of Mahabalipuram & Trichy in India. You arrive in Mumbai by international flight. Upon arrival assistance and check-in hotel for short stay. 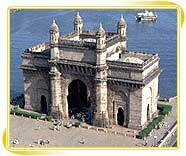 Later we leave for half Day sightseeing tour of Mumbai starting with the Gateway of India, the entrance to the port of Mumbai. It was built to commemorate the visit of King George V in 1911. Historically the Gateway holds greater significance as last of the British troops, which left independent India by sea, marched through its portals. Followed by the Elephanta Caves boat cruise from Gateway of India. The caves are at the top of a gentle stairway, which begins almost immediately where the ferry wharf hits dry land. Later on time transfer to the airport to board the flight for Chennai, upon arrival assistance and check-in hotel for overnight stay. ToDay morning post breakfast we leave for half Day sightseeing to Chennai city, touching Fort St. George, San Thome Cathedral and the museums that contain the world's most complete and impressive selection of Chola bronzes and stone sculptures from South India and the Deccan and drive to Mahabalipuram for overnight stay at hotel. After breakfast, we drive at 1000 hrs for an excursion to Kanchipuram, one of the seven sacred cities of India. From 6th to 8th centuries when Kanchipuram became the Pallava capital, the arts especially literature, music and dance prospered and first South Indian stone temples were constructed by King Mahendra Varma-I, who converted from Jainism to Hinduism and worshipped the God Shiva. Your sightseeing will include Kailasanatha Temple, the oldest and most beautiful temple of Kanchipuram, reflecting the freshness & simplicity of early Dravidian architecture, and built by Pallava King Rajasimha in the late 7th century. Sri Ekambaranathar Temple is dedicated to Shiva and is one of the largest temples in Kanchipuram constructed by Pallavas. The temple's name is said to have derived from Eka Amra NatharLord of the Mango tree and there is an old mango tree with four branches representing the four Vedas. A plaque nearby claims that the tree is 3500 years old. We move on to Kamakshi Amman Temple which is an imposing temple dedicated to the goddess Parvathi in her guise as Kamakshi, the goddess who accedes to all requests and Vaikunta Perumal Temple is dedicated to Vishnu. Later drive back to Mahabalipuram and overnight stay at hotel. 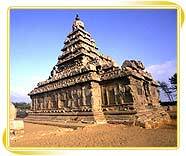 ToDay we leave at 1000 hrs for a half Day sightseeing of Mahabalipuram. We cover the Shore Temple: Ravaged by natural forces of sea and wind, the Shore Temple is the remaining master-piece of Pallavas architecture next we visit to Five Rathas: The Five Rathas are sculptured temples carved from solid rock in the shape of Chariots (Rathas). They lie about 200 m south of the main hill and were fashioned out of a smaller hill sloping down from the south and finally visit to Arjuna's Penance This bas-relief, hailed as one of the major glories of Indian art, is a huge rock canvas with chisel-sketches of the denizens of the triple world of Gods & demi-gods, of humans, birds and animals and of Nagas & nymphs all fitting harmoniously into the theme of the penance of Arjuna. Evening at leisure and overnight stay at hotel. Morning post breakfast, we drive at 0900 hrs to Auroville near Pondicherry. The community of Auroville consists of Indian & International residents who aim to develop a harmonious enviroment through the implemention of the teachings Sri Aurobindo & The Mother. The community is involved in Integral Development of humananity and socially useful projects. Upon arrival visit Matrimandir which was designed to be the spiritual and physical centre of Auroville. The meditation hall is lined with white marble and contains a solid crystal (Reputedly the largest in the world) 70 cm in diameter and manufactured by the Zeiss company in Germany. (The temple is opened between 1530-1630 hrs). Next we drive to Pondicherry, the land of Sri Aurobindo Ashram, the serene world of distinct spiritual vibration and thus renowned as Sacred Land. Upon arrival check-in hotel. Evening at leisure and overnight stay at hotel. ToDay we will cover Chidambaram, Chidambaram Temple is one of the most ancient and most celebrated shrines in India located in Cuddalore district of Tamilnadu. It is of great religious as well as historic and cultural significance. Chidambaram is associated with Lord Nataraja or Shiva in his "Ananda Tandava" pose (the Cosmic Dance of Bliss) in the Cosmic golden hall and the hall of Consciousness ('Chit Sabha'). Further proceed to Thanjavur, upon arrival assistance and check-in hotel for overnight stay. After breakfast, we leave at 0800 hrs to visit Brihadeshwara temple, also known as the 'Big Temple', built by the Chola emperor Raja Raja I (985-1013 AD). It was the ancient capital of Chola kings. This is the Chola dynasties finest contribution to Dravidian art. This massive temple is 216 feet high topped by a huge monolithic cupola weighing over 80 tones. The architectural wonder of this temple is that the shadow of it's cupola never falls on the ground. After that we visit Thanjavur Palace and Museum. 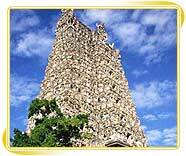 In the afternoon at 1300 hrs we leave for Trichy covering Srirangam Temple & Rockfort, Trichy's most famous landmark, which has a Temple, perched on the outcrop of Rock. Srirangam is an ancient and most sacred temple of Vaishnavites and is situated in an island formed by river Cauvery and its tributary Kollidam. The giant 13-storied gopuram (gateway tower) of the temple is seen from several miles away. This huge temple complex, which has 21 gopurams and numerous other interesting religious structures was built by Pallava, Chola, Pandya and other rulers. Next we drive to Madurai for overnight stay in hotel. Madurai, also called the "city of nectar" is one of the oldest cities of India with a history dating back to 6th century B.C. and has been a centre of learning and pilgrimage for centuries. This sacred city attracts thousands of pilgrims and visitors from India as well as abroad. Later in the afternoon at 1500 hrs we visit Meenakshi Sundareshwar temple, one of the largest temple complexes in India built between the 16th and 18th centuries by Pandyan rulers. This 'living' temple is an example of Dravadian architecture with gopurams covered from top to bottom in a breathtaking profusion of multicoloured images of gods, goddesses, animals, mythical figures etc. There are two shrines, one dedicated to Sundereshwarar (Shiva) and the other to his consort Meenakshi (Parvati). The Hall of 1000 Pillars is the most striking feature in the temple, which was built in 16th century. Apart from the estimated 33 million sculptures there, the temple is absolutely absorbing with the endless rounds of ceremonies, prostration of countless devotees and glittering market stalls. Overnight stay. Morning post breakfast we leave for Kanyakumari, the Southern most point of Indian mainland territory, at the confluence of the Indian Ocean, Arabian Sea and Bay of Bengal. After check-in at the hotel we visit Vivekananda Rock Memorial and the Temple of Virgin Goddesses. The full moon evenings offer one of the best sunsets and moon rise simultaneously. Evening at leisure and stay overnight at hotel. 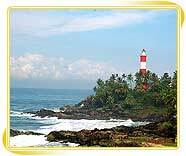 After breakfast we head for Kovalam, south of Trivandrum and one of India's best beaches. The Day is invested in exploring the unbounded beauty of this place. Kovalam offers among the best ayurvedic massage and treatment in the world. Overnight stay. Day at leisure and overnight stay at hotel. ToDay we leave for an excursion to Trivandrum, located on the South-western tip of India. Famous for its long shorelines with glorious beaches, historic monuments, backwater stretches and a rich cultural heritage, Trivandrum undoubtedly makes an ever-popular destination. We spend half a Day here covering Padmanabha Swamy Temple, Shri Chitra Art Gallery and the Museum. Later we drive back to Kovalam. Overnight stay.